Google shook the gaming world with its announcement at GDC 2019. The search giant's new online gaming platform will allow you to run AAA games on any hardware (PC or smartphone) compatible with Google Chrome or Chromecast regardless of the power of that device. But what games are supported? At the moment there are few certainties but we will update this list as more information becomes available. Google promises streaming up to 4K resolution at 60fps with HDR+ at launch, with updates to 8K and 120fps possible in the future. For now, these are the titles that you can expect on the new game streaming service made by Google! "There was a conversation between me and Google before I joined the company. My point of view, in order to give players exactly what we wanted to promise, was that we had to build our own games. We had to create experiences that were exclusive to Stadia; it was a fundamental direction in which to move." "I understand that the word "exclusive" can sometimes be a difficult term. I would like to talk about games that are built specifically for a data center. And if these games then appear on other streaming platforms, that's fine, because it means that developers have begun to innovate and think about the future and the creation of games from the 21st century, rather than games from the 20th century." 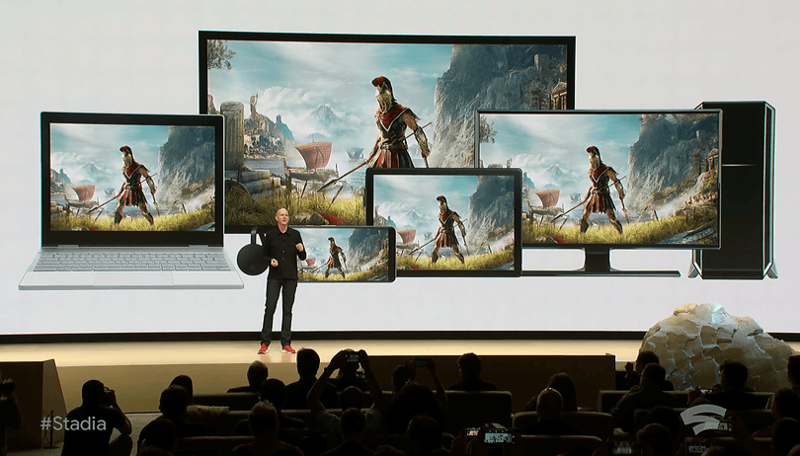 Harrison has however confirmed that the games developed directly by Google will remain exclusive for Stadia. Jade Raymond, now head of the Stadia Games and Entertainment division, is taking care of the development of these titles. Ubisoft is one of the first announced partners. The last chapter of the series dedicated to the world's most famous guild of killers has already been seen running on Project Stream (the closed beta launched by Google last October which ended in January) and then on the version of Stadia shown on stage at GDC 2019. Some of the company representatives were also present at the Project Stadia launch event. At GDC 2019 it was also possible to try the next chapter of the frantic id Software shooter. Excellent for verifying the response of the servers to the actions of users, DOOM Eternal has proven to run in a more than acceptable way on Google Stadia. However, it was a controlled environment and we will have to verify the input lag values that could be caused by the distance between the end user and Google's data centers for ourselves. Are you interested in trying the service and abandoning expensive old consoles? Let us know in the comments below. Implementing a fully functional game streaming platform for the masses supporting graphic intensive games running at high resolution in today's time is so much capital intensive that I guess even if Google wants to, probably they will not be able to provide unrestricted service to users without charging a subscription fee. Not only the cost of investment has to be covered, but also there has to be a significant profit margin for game developers and Google themselves. Difficult!